The arachnologist Dr Peter Jäger of the Senckenberg Research Institute in Frankfurt has discovered a new genus from the family of huntsman spiders. He was able to describe a total of four new species within this genus, which occurs in South Africa and Namibia. Besides special setae at the tips of their feet, which likely prevent the animals from sinking into the sand, the eight-legged creatures are characterized by their interesting mating behaviour. The study was recently published in the scientific journal "African Invertebrates." To discover a living huntsman spider in the South African deserts is a difficult feat; to study the spider in detail is almost impossible. 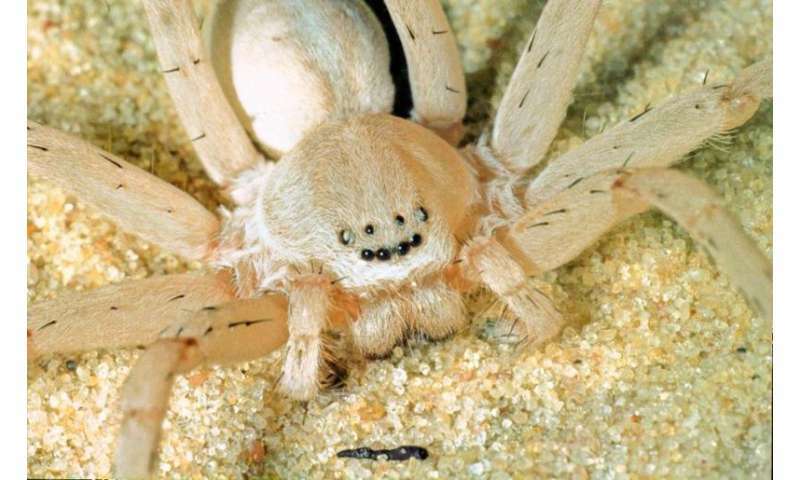 The eight-legged animals are quick, nocturnal, and dwell in inconspicuous tunnels in the sand. "Fortunately, we have our collection that we can fall back on," says Dr Peter Jäger, arachnologist at the Senckenberg Research Institute in Frankfurt. In his lab, Jäger was now able to identify a new genus with four associated new species of huntsman spiders (Sparassidae). "The spiders of one species were collected in the year 2004 by my doctoral student at the time, Dirk Kunz, and I now described them together scientifically as May bruno." The name was assigned in the context of the bio-sponsorship program (www.biopat.de); a daughter uses it to honour her father. Molecular-genetic studies of Jäger's colleague Henrik Krehenwinkel confirmed that the animals belong to a new genus. The tips of the feet of these newly discovered desert dwellers with a leg span of 8 to 10 centimetres are particularly conspicuous. They contain unique tufts of setae with feathered tips. 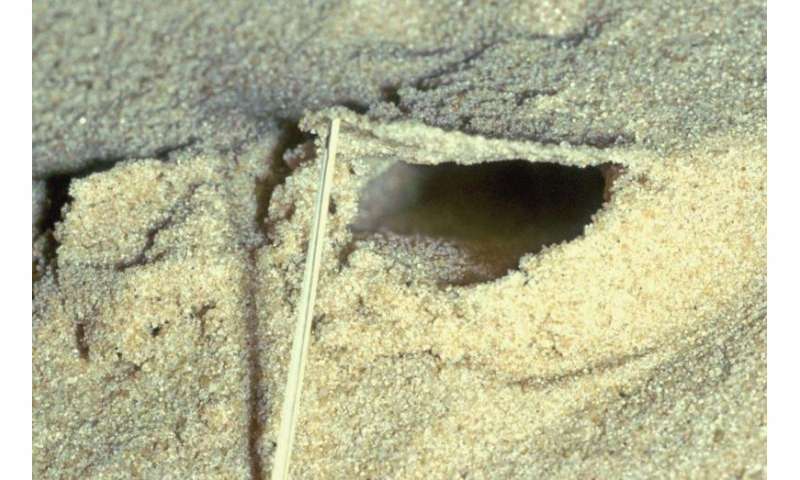 "They likely serve to prevent the animals from sinking into the sand and help them remain on the surface," speculates the spider researcher from Frankfurt. Jäger is well aware of the huntsman spiders' ingenuity when it comes to moving across the hot desert sand, at the latest since his discovery of a spider in this family that moves by means of flic-flacs or somersaults. In addition, Jäger found yet another special trait in these spiders. All four females he inspected showed paired bite marks on their cephalothorax. "It is quite possible that these injuries were sustained during mating," explains Jäger, and he adds, "We were unable to find these marks on the males of the 'Love Bite Spider'". Jäger refuses to speculate about the meaning of such behaviour and hopes that his colleagues will be able to observe the copulation in the field. However, since only 6 out of 45,000 spider species worldwide have males injuring conspecific females during courtship or mating, it is a very interesting finding. More information: Jäger, P. & Krehenwinkel, H. 2015. 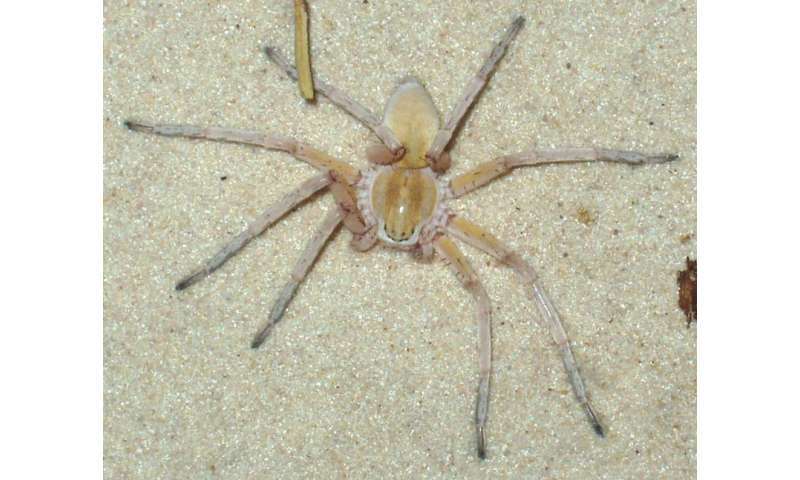 May gen. n. (Araneae: Sparassidae): a unique lineage from southern Africa supported by morphological and molecular features. African Invertebrates 56 (2): 365–392.